Baked Tofu Veggie Skewers starring flavorful Lemon-Rosemary Marinade are perfect for picnics and dinner parties! Serve them hot or cold. You don’t have to fire up the grill to have some skewer goodness! These Baked Tofu Veggie Skewers scream summer, but you bake them in the oven instead of cooking on the grill. Perfect for a busy evening when you want a summery supper, and pressing the tofu for them is quick and easy with the EZ Tofu Press! I don’t know what it is about food on sticks, but skewers just make dinner more fun! And fun food tastes better. That’s just science. Making your Baked Tofu Veggie Skewers requires very little hands-on time. 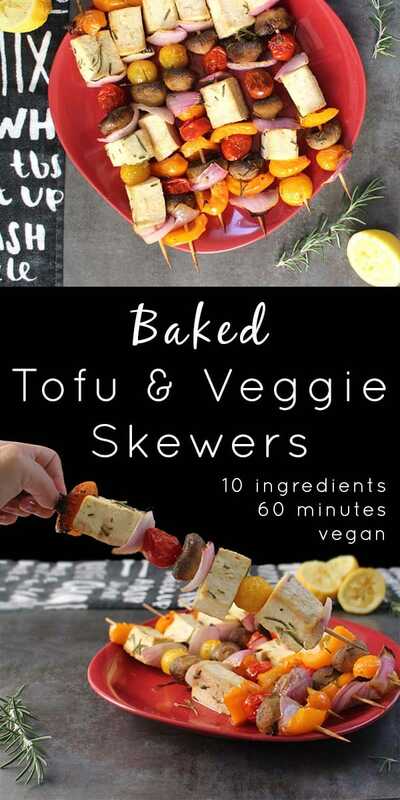 Soak your skewers while you press and marinate your tofu, then put it together and bake in the oven, flipping once. If you want to save time, you can press your tofu the night before and marinate your overnight, so you just have to skewer and bake at supper time. Pressing the tofu is so important in this recipe. You want your tofu nice and firm, so it will hold up to skewering. You also want it to have plenty of room to drink in your flavorful marinade. I use my EZ Tofu Press to press the excess water out of my tofu. 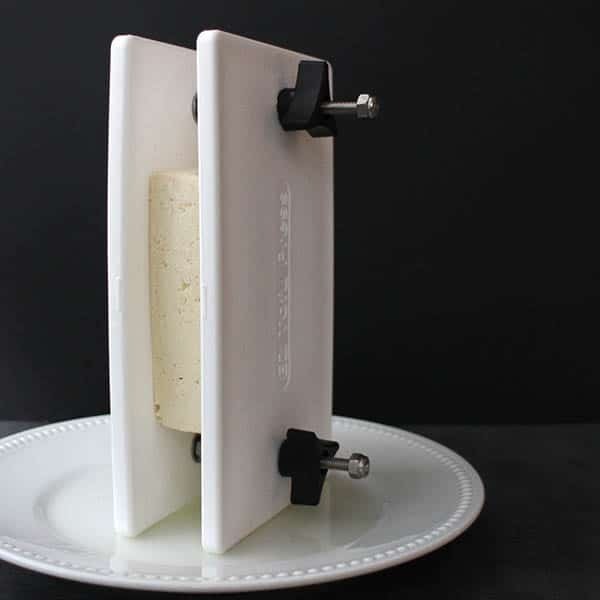 You can get out around a half cup of water when you use the EZ Tofu Press, which turns your block of tofu into a flavor sponge, ready to drink in your marinade. Speaking of that marinade! I’m obsessed with this easy Lemon-Rosemary Marinade that also works as a salad dressing. Whisk together you oil, vinegar, herbs, and spices, and you’re ready to season that tofu. Let’s do it! Submerge 6 bamboo skewers in enough water to cover. Set aside to soak, while you prep everything else. Transfer the tofu pieces to a shallow dish, and pour the marinade over them. Set aside to marinate while you prep the rest of your veggies. I'd marinate for at least 15 minutes, but 30 to 60 minutes is ideal. Make your skewers! 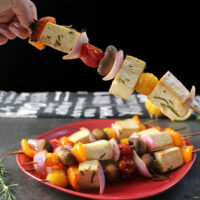 Arrange the tofu, grape tomatoes, onion, bell peppers, and mushrooms on your skewers, and place them on a baking sheet lined with parchment paper or a silpat. Brush on extra marinade. Bake for 30 minutes, flipping and brushing with more marinade after 15 minutes. You know how much I love tofu! Can’t wait to try your recipe! My boys would love to help assemble these! I love the simplicity of the flavors you’ve used. It really looks like the veggies are allowed to shine here, but there is just enough seasoning to give the tofu a nice boost! Rosemary is one of my fave herbs! So fragrant and flavorful! These skewers look delicious and super fun. Even the kids would love eating these! Mine too! We luckily have a huge rosemary bush out front. I love the sound of that lemon rosemary marinade! Love, love that combo and on skewers sounds like just the perfect summertime dish for a party! Thank you! Lemon rosemary is one of my faves. I’m always impressed by how much liquid I can get out of my tofu block when using the tofu press. Makes a huge difference on retaining flavor too, so now I can’t go without it. Looking forward to trying your marinade next time. That tofu looks incredible! I’ve gotta try this one. These look so good! I just got a little rack with skewers for my air fryer, so I just might make these with it first! 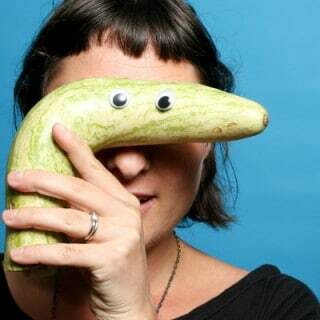 Ooh that is a fun accessory! I’m in the market for a new air fryer, and I want some accessories with it! Yay, another one of your tasty tofu recipes! These look perfect for the grill. We actually just got a grill yesterday so I’ll be checking these out soon! Ooh let me know! We always do veggie dogs or burgs when we grill, so I haven’t grilled these yet! Lemon rosemary is one of my all-time favorite tofu marinades. Your skewers sound like a great, full-meal on a stick. Thank you, Cadry! It’s one of mine, too! You are so right about food on sticks being so much more fun! They look delicious too. I love all of the lovely rosemary in the marinade. My favourite herb! Looks absolutely delicious! And I love how easy they are to make. What a great recipe and video! I have my block of extra firm tofu so guess what. 🙂 I really do love how easy this recipe looks. Sounds delicious!